Los Angeles County's bustling streets have traditionally offered little accessibility to transit stations for people walking and biking, making public transit seem a few steps too far from one's home, work, or other daily destinations. First Last Mile Strategic Plan & Planning Guidelines is the Los Angeles County Metropolitan Transportation Authority's (Metro) and the Southern California Association of Governments' (SCAG) answer for improving the first and last mile connections to and from transit stations for public transit users. To date, First Last Mile Strategic Plan & Planning Guidelines have been formally adopted and are in their initial phases of implementation. Most transit users in Los Angeles walk or roll themselves to public transit stations to complete multi-modal daily commutes, however the facilities provided for these people are often subpar, with the majority of Los Angeles's street space dedicated to the automobile. The plan provides a framework and is a toolbox for localities to build support and resources for developing active transportation infrastructure like sidewalks, protected bike lanes, and clear signage directing users to regional transit hubs. Ultimately, the plan represents a broader view of planning for accessibility to transportation and responds to Metro's core challenge — improving the reach of transit and increasing transit ridership throughout the county. The Pathway is an innovative model within the plan that outlines rationally planned and intelligently designed active transportation networks within station areas, promoting transit connectivity from one mode to another. To enhance the Pathway, innovative concepts are described, such as the Rolling Lane and Green Zone. The Rolling Lane is a shared protected lane in the roadway for bikes, skateboarders, electric mobility scooters, and other rolled mobility devices, while the Green Zone is a dedicated area immediately next to the transit station that allows priority waiting, parking, and drop-off for electric, shared ride, and other alternative vehicles. These concepts and others support regional mobility, community health, and clean air policies, and build off of existing regional sustainable communities and transportation strategies. 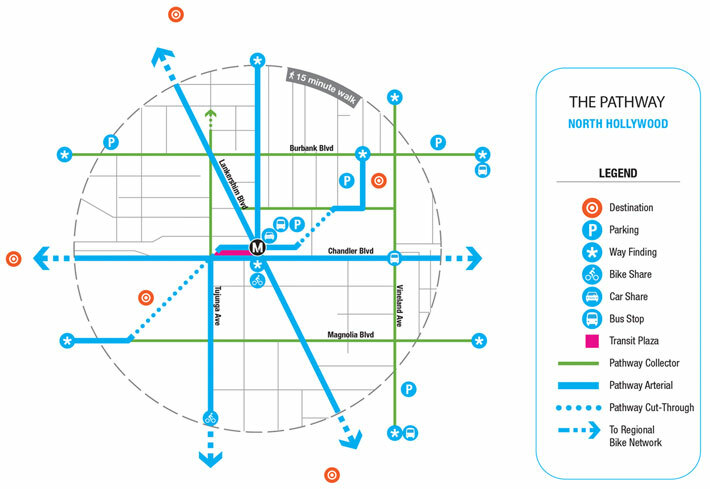 Proposed 'Pathway' map for the North Hollywood Metro Rail/BRT Station. Central to the creation of the plan was the Technical Advisory Committee (TAC), a group of diverse representatives ranging from Metro transportation planners to academics to bicycle, pedestrian, and environment advocates, charged with providing valuable feedback throughout the developmental stages of the plan. Leaders of TAC took ownership in the plan and have been instrumental in building public support. One reason TAC and public support have become so strong is the plan's simplicity and clarity. Transportation plans are notorious for being overly technical and difficult for the average person to understand. 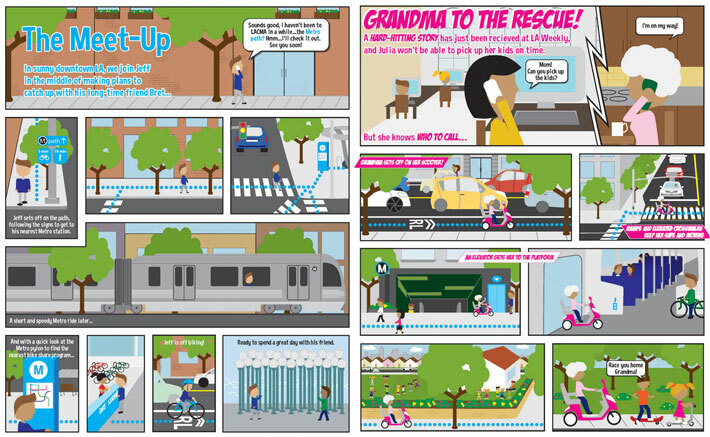 With its heavy use of infographics and imagery, Metro and SCAG were able to build a comprehensible framework for regional transportation agencies and, ultimately, transit users. Sample graphic novels used in document to illustrate concept to a broad range of viewers. Today, broad-based support for the plan has led to the Metro Board calling for the development of pilot projects along existing lines and the prioritization of first last mile projects in Metro's biennial grant programs. SCAG is earmarking funding for pilot projects. SCAG, Metro, and other local jurisdictions are requiring First Last Mile Plan consistency in TOD planning projects they support or fund.